I chose this area because I often witness my students having limited background knowledge or I see them struggling with ways to activate their prior knowledge. 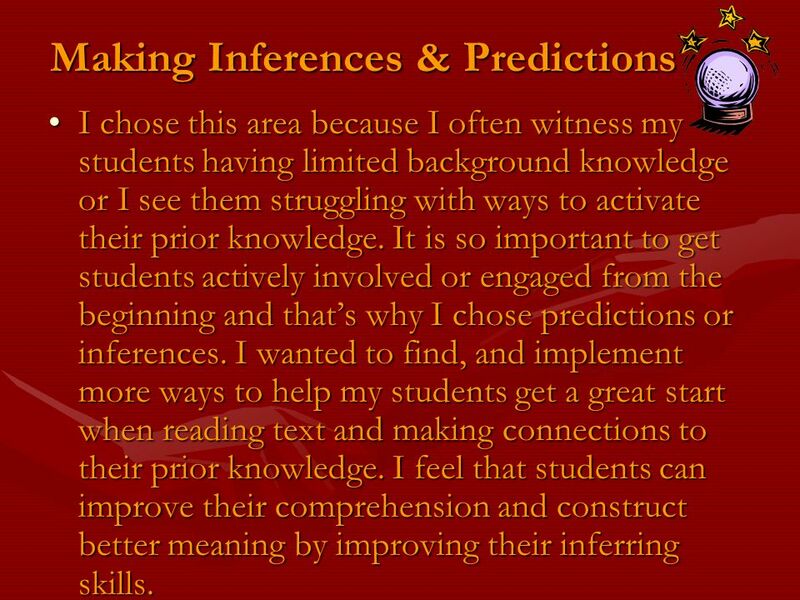 It is so important to get students actively involved or engaged from the beginning and that’s why I chose predictions or inferences. 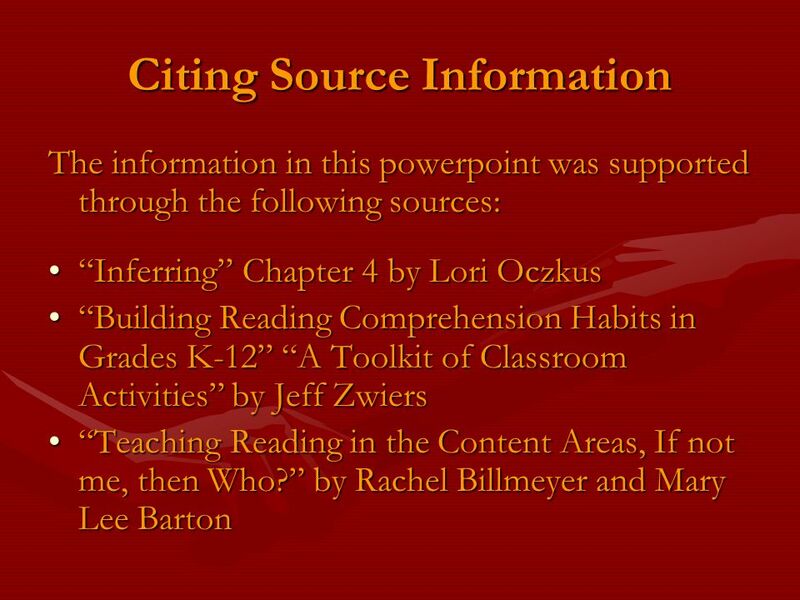 I wanted to find, and implement more ways to help my students get a great start when reading text and making connections to their prior knowledge. 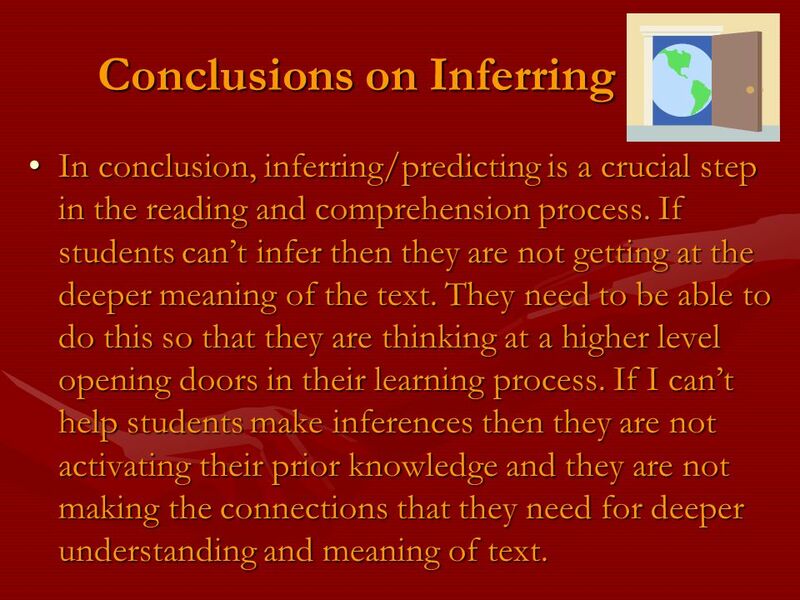 I feel that students can improve their comprehension and construct better meaning by improving their inferring skills. Thinking at a higher level. Being able to infer separates good readers from struggling readers. It’s a way to gather information from different sources to make connections or conclusions about what the text means. It’s “reading between the lines” or finding the clues to better understand the text. (Oczkus, pg.83) It’s an author “showing rather than telling” the emotions of a character. (R. Caplan from Inferring by Lori Oczkus). If a student tries to predict more often, then they have a greater chance of being right. (Jeff Zwiers, pg. 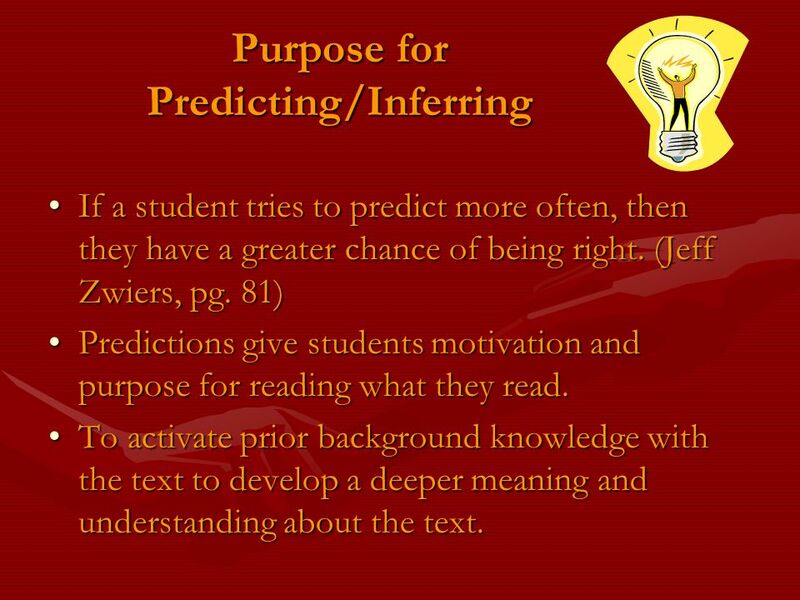 81) Predictions give students motivation and purpose for reading what they read. To activate prior background knowledge with the text to develop a deeper meaning and understanding about the text. 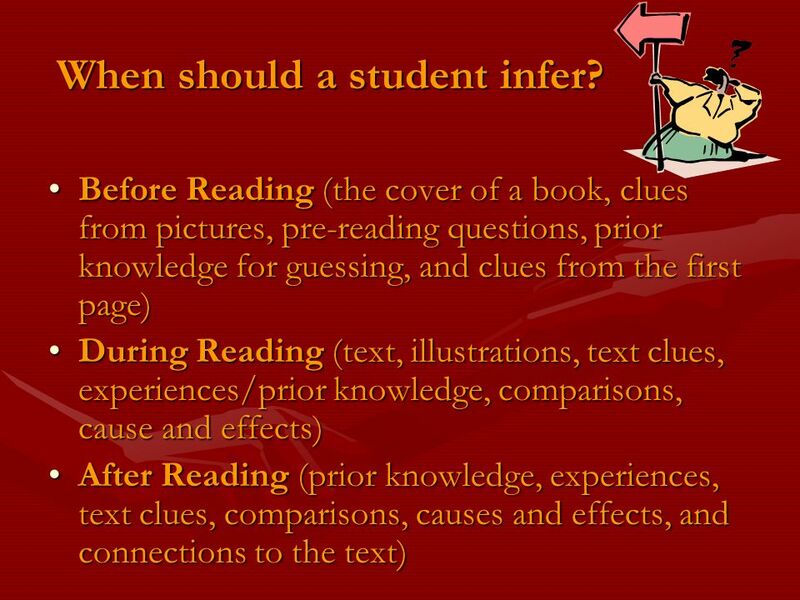 5 When should a student infer? 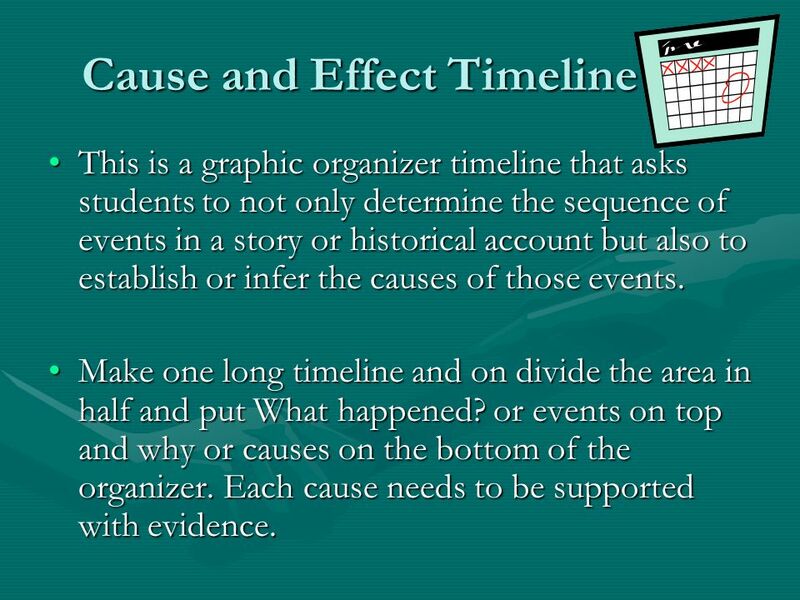 This is a graphic organizer timeline that asks students to not only determine the sequence of events in a story or historical account but also to establish or infer the causes of those events. Make one long timeline and on divide the area in half and put What happened? or events on top and why or causes on the bottom of the organizer. Each cause needs to be supported with evidence. 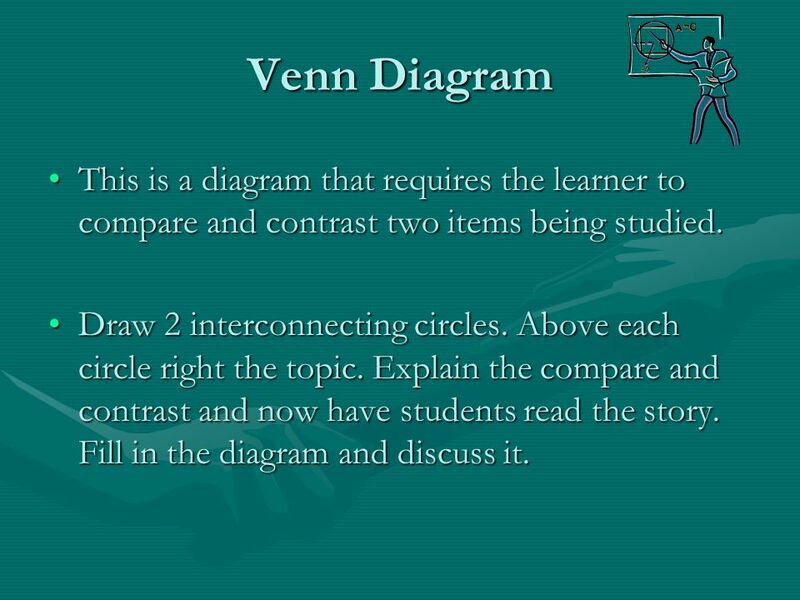 9 Venn Diagram This is a diagram that requires the learner to compare and contrast two items being studied. Draw 2 interconnecting circles. Above each circle right the topic. Explain the compare and contrast and now have students read the story. Fill in the diagram and discuss it. 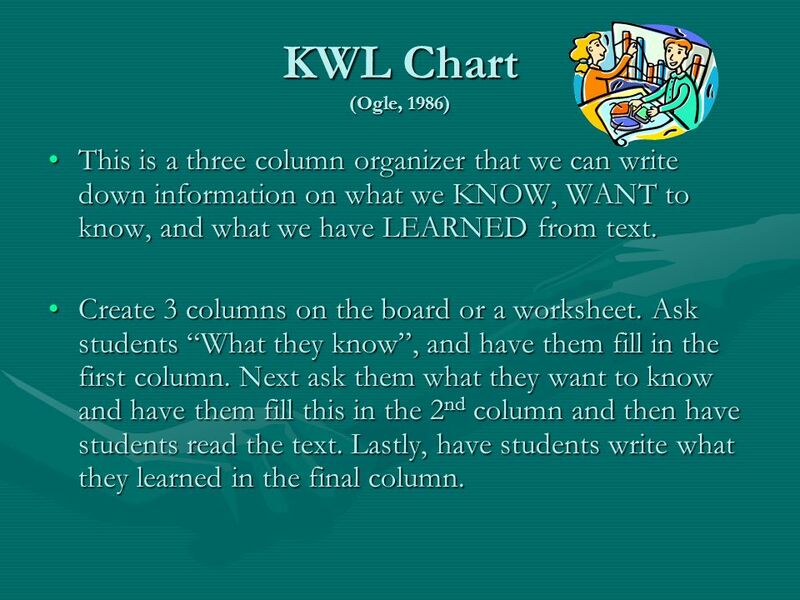 10 KWL Chart (Ogle, 1986) This is a three column organizer that we can write down information on what we KNOW, WANT to know, and what we have LEARNED from text. Create 3 columns on the board or a worksheet. Ask students “What they know”, and have them fill in the first column. Next ask them what they want to know and have them fill this in the 2nd column and then have students read the text. Lastly, have students write what they learned in the final column. 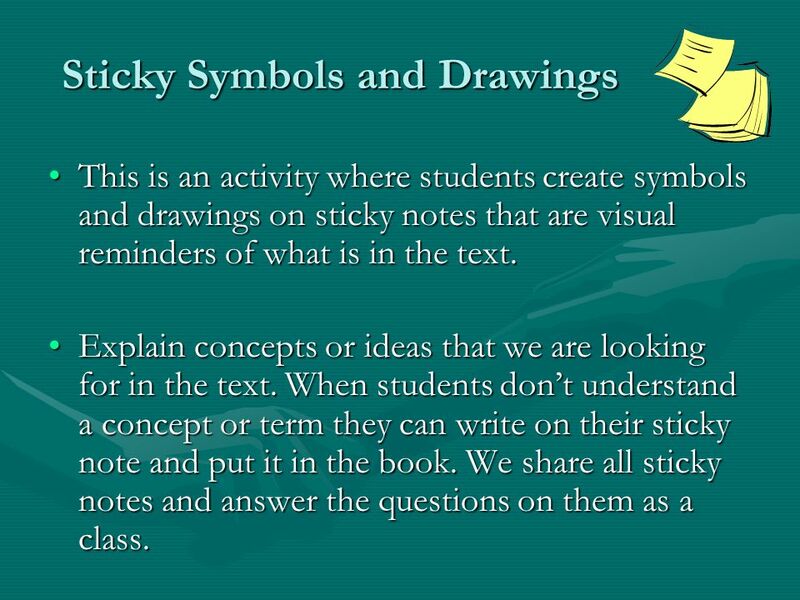 This is an activity where students create symbols and drawings on sticky notes that are visual reminders of what is in the text. 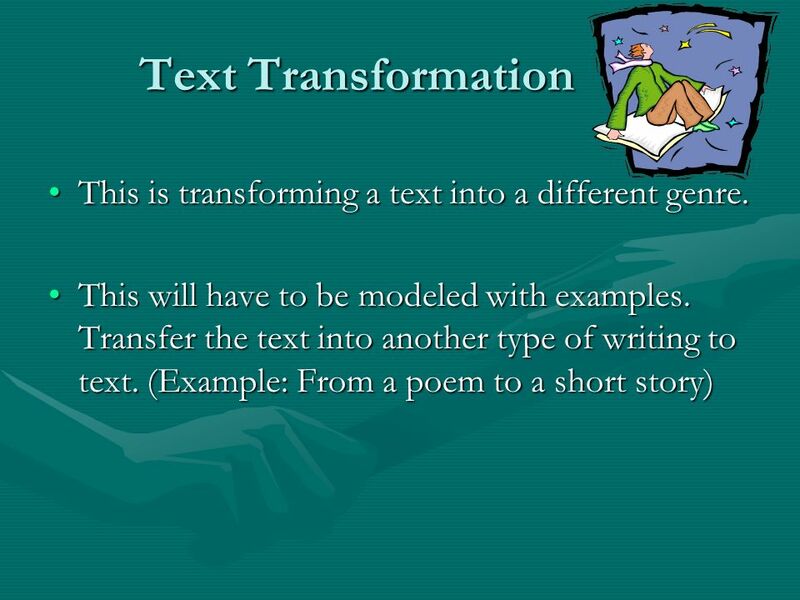 Explain concepts or ideas that we are looking for in the text. When students don’t understand a concept or term they can write on their sticky note and put it in the book. We share all sticky notes and answer the questions on them as a class. This is a map that students create starting with a key concept/idea and branching out from that. 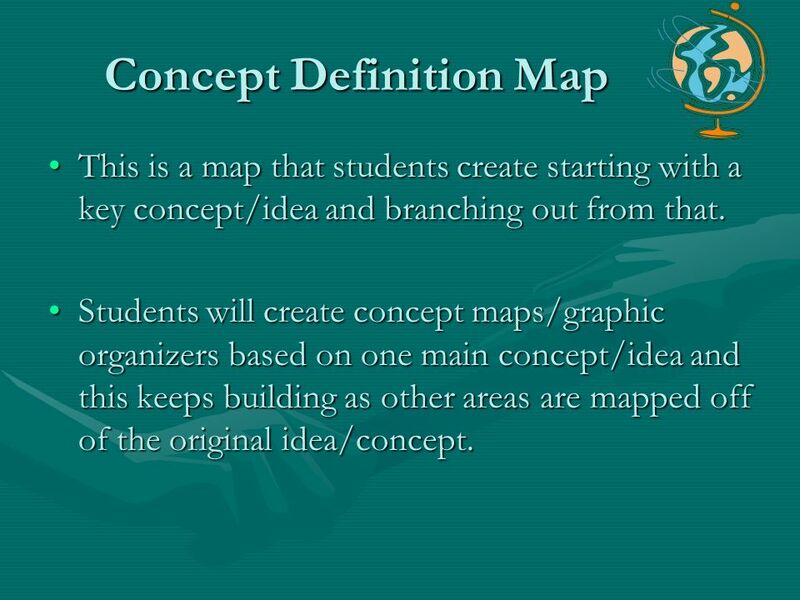 Students will create concept maps/graphic organizers based on one main concept/idea and this keeps building as other areas are mapped off of the original idea/concept. 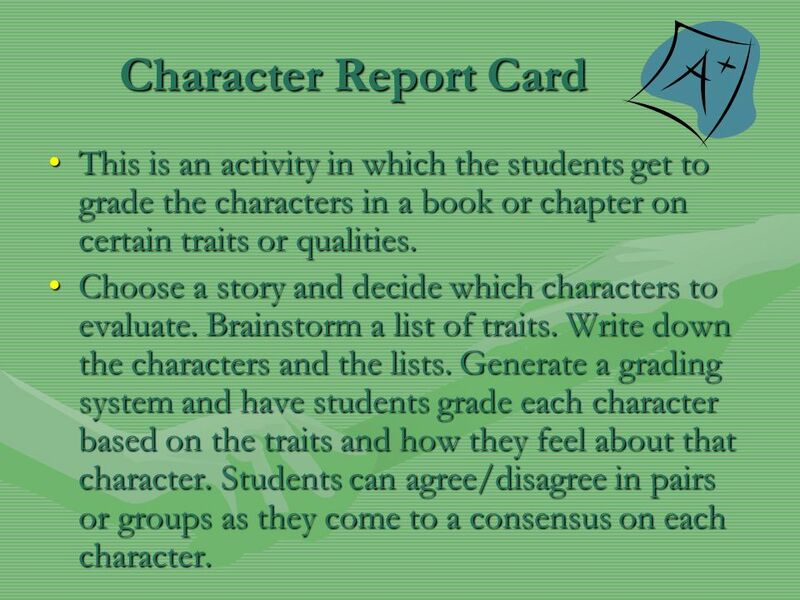 15 Character Report Card This is an activity in which the students get to grade the characters in a book or chapter on certain traits or qualities. Choose a story and decide which characters to evaluate. Brainstorm a list of traits. Write down the characters and the lists. Generate a grading system and have students grade each character based on the traits and how they feel about that character. Students can agree/disagree in pairs or groups as they come to a consensus on each character. This is a simple way to show how we connect background knowledge with text information to make inferences. Need to find a text in electronic form. Find words or phrases that students can take out and change with their own words. Have students underline in the text what context clues they found to help them make inferences to what the meaning was. 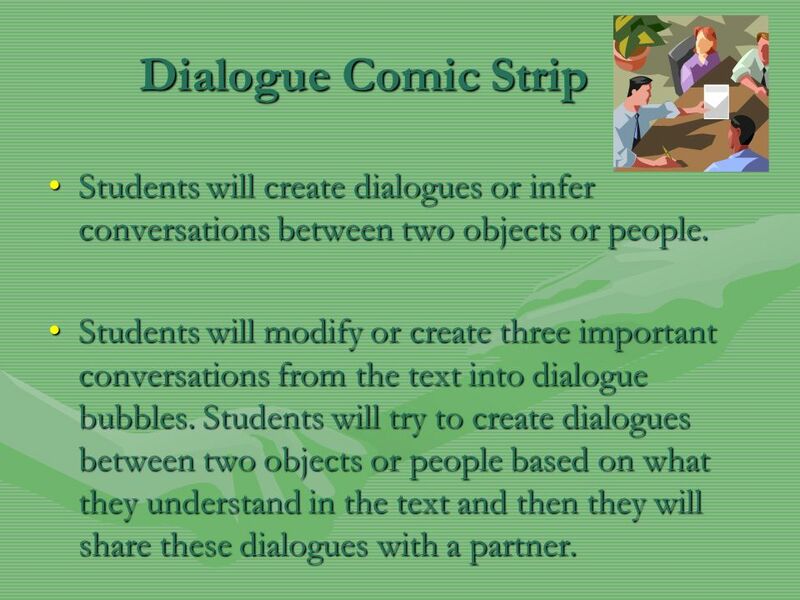 17 Dialogue Comic Strip Students will create dialogues or infer conversations between two objects or people. Students will modify or create three important conversations from the text into dialogue bubbles. Students will try to create dialogues between two objects or people based on what they understand in the text and then they will share these dialogues with a partner. 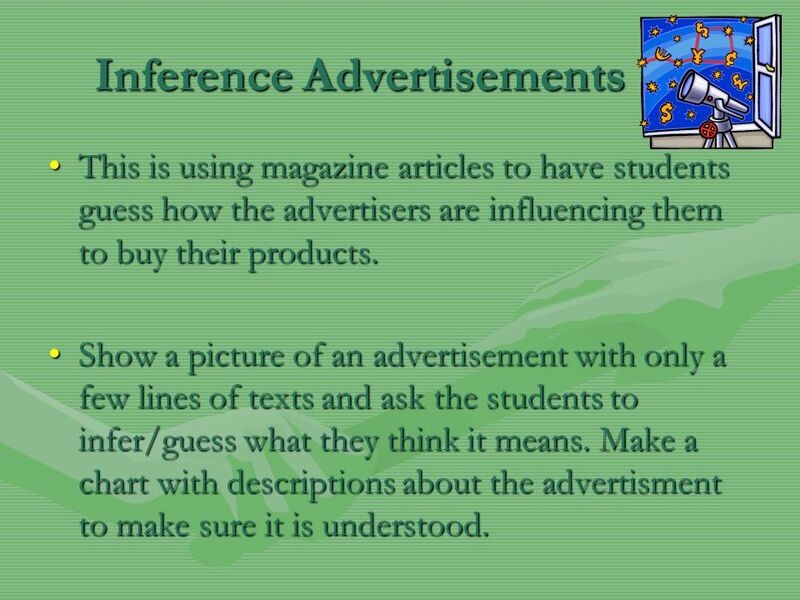 This is using magazine articles to have students guess how the advertisers are influencing them to buy their products. Show a picture of an advertisement with only a few lines of texts and ask the students to infer/guess what they think it means. Make a chart with descriptions about the advertisment to make sure it is understood. This is a fun activity to get students actively involved in inferring. 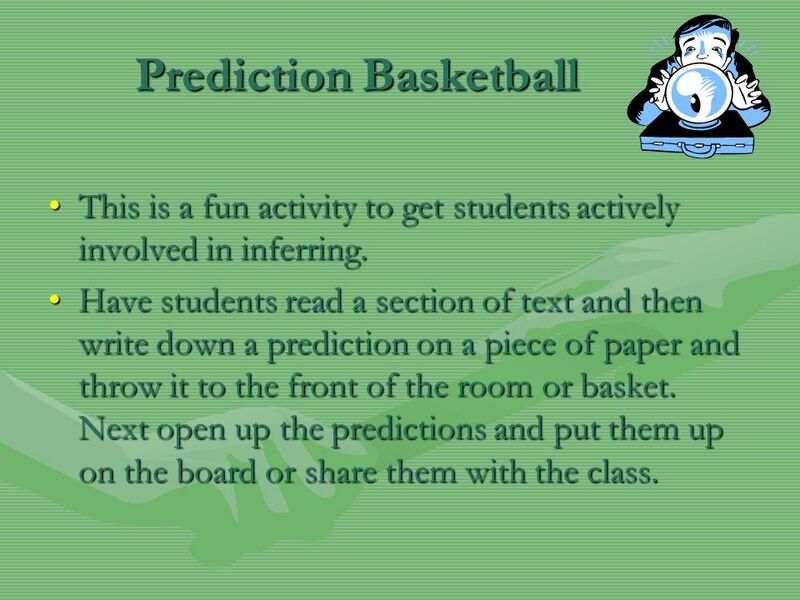 Have students read a section of text and then write down a prediction on a piece of paper and throw it to the front of the room or basket. Next open up the predictions and put them up on the board or share them with the class. 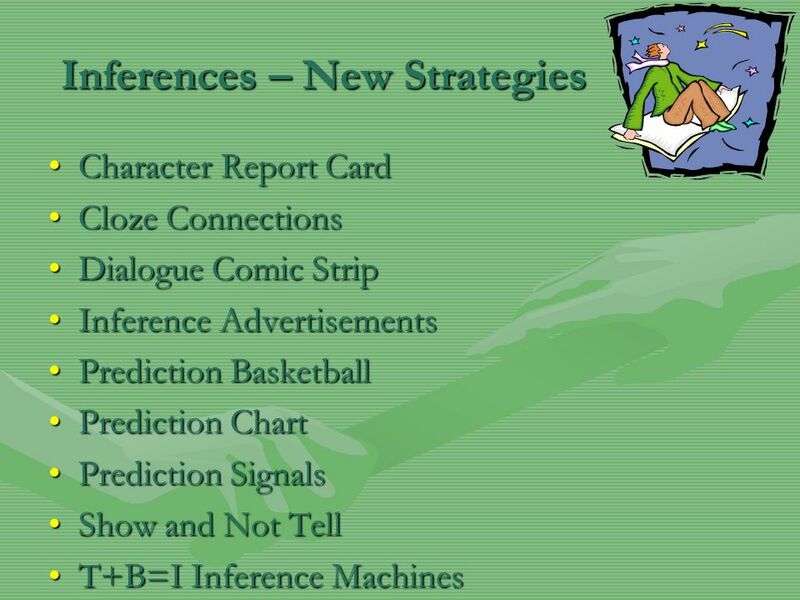 20 Prediction Chart This is a way for students to find good evidence for making predictions. 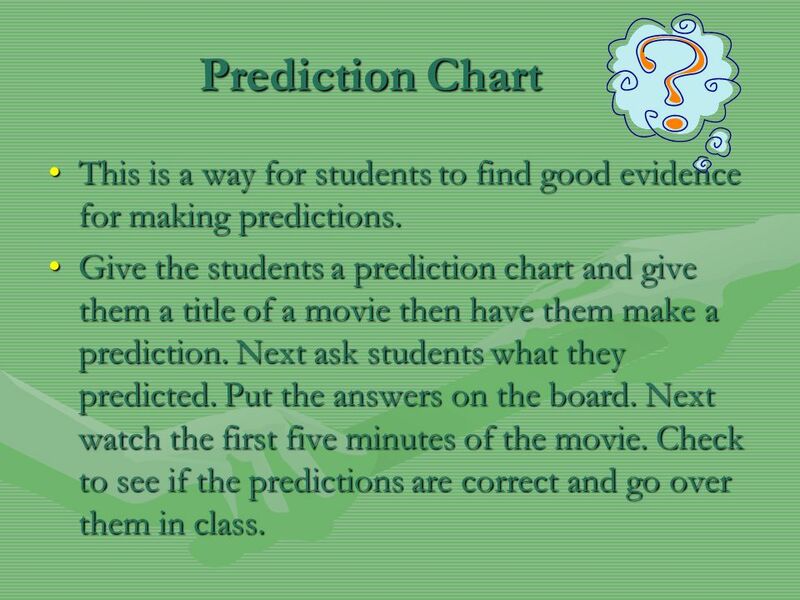 Give the students a prediction chart and give them a title of a movie then have them make a prediction. Next ask students what they predicted. Put the answers on the board. Next watch the first five minutes of the movie. Check to see if the predictions are correct and go over them in class. 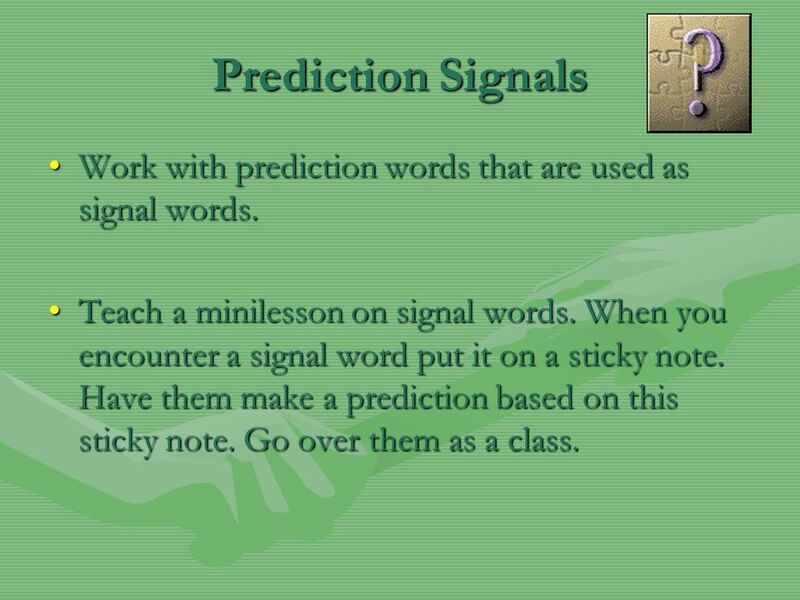 21 Prediction Signals Work with prediction words that are used as signal words. Teach a minilesson on signal words. When you encounter a signal word put it on a sticky note. Have them make a prediction based on this sticky note. Go over them as a class. 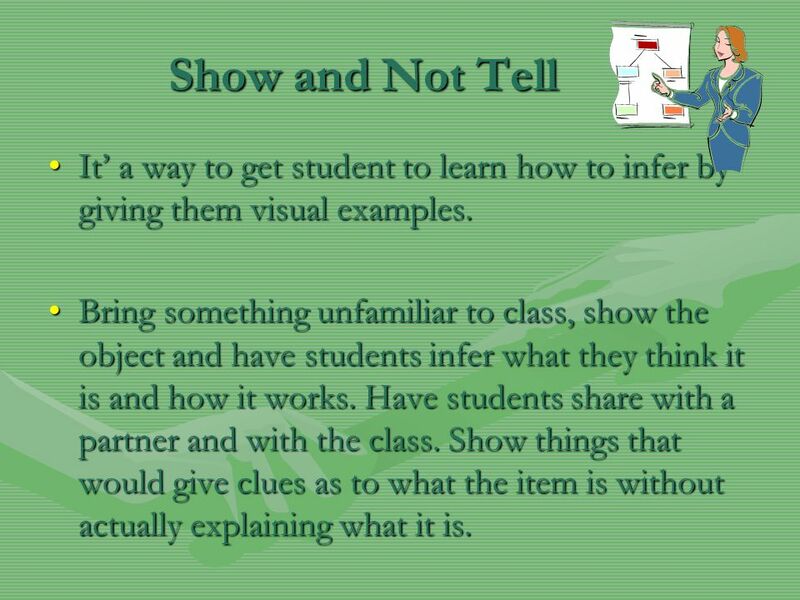 22 Show and Not Tell It’ a way to get student to learn how to infer by giving them visual examples. Bring something unfamiliar to class, show the object and have students infer what they think it is and how it works. Have students share with a partner and with the class. Show things that would give clues as to what the item is without actually explaining what it is. This is a visual organizer that is somewhat like an assembly line of the brain. 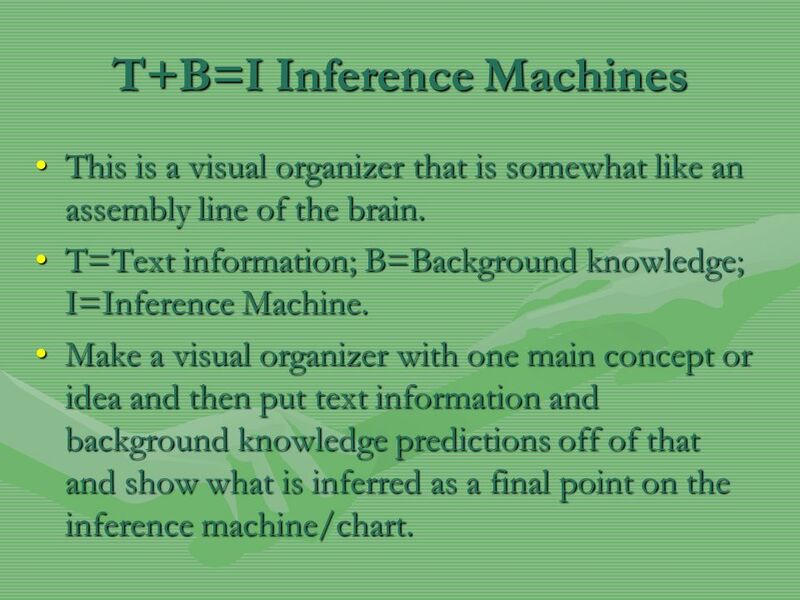 T=Text information; B=Background knowledge; I=Inference Machine. Make a visual organizer with one main concept or idea and then put text information and background knowledge predictions off of that and show what is inferred as a final point on the inference machine/chart. 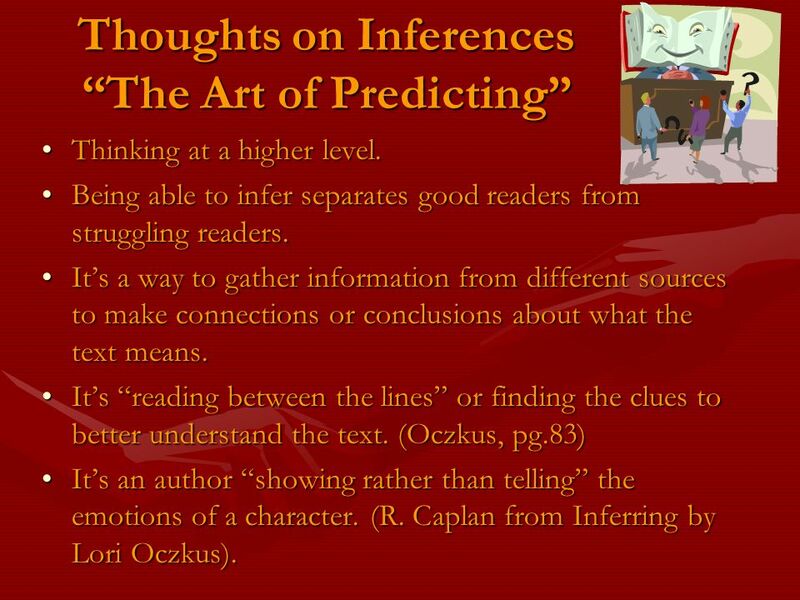 In conclusion, inferring/predicting is a crucial step in the reading and comprehension process. 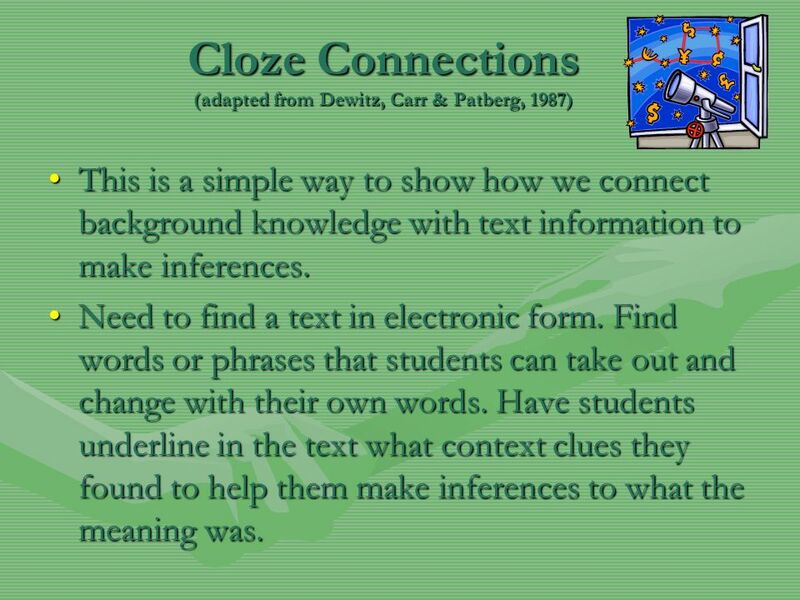 If students can’t infer then they are not getting at the deeper meaning of the text. They need to be able to do this so that they are thinking at a higher level opening doors in their learning process. 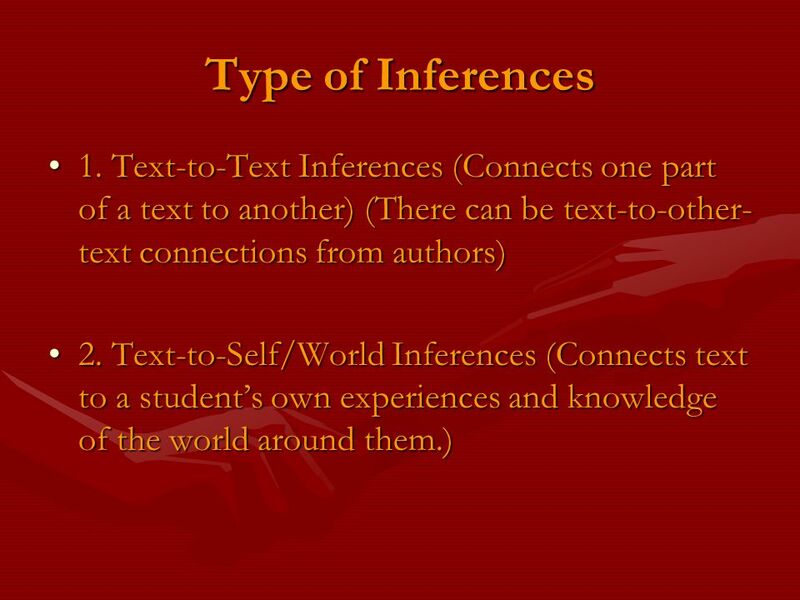 If I can’t help students make inferences then they are not activating their prior knowledge and they are not making the connections that they need for deeper understanding and meaning of text. 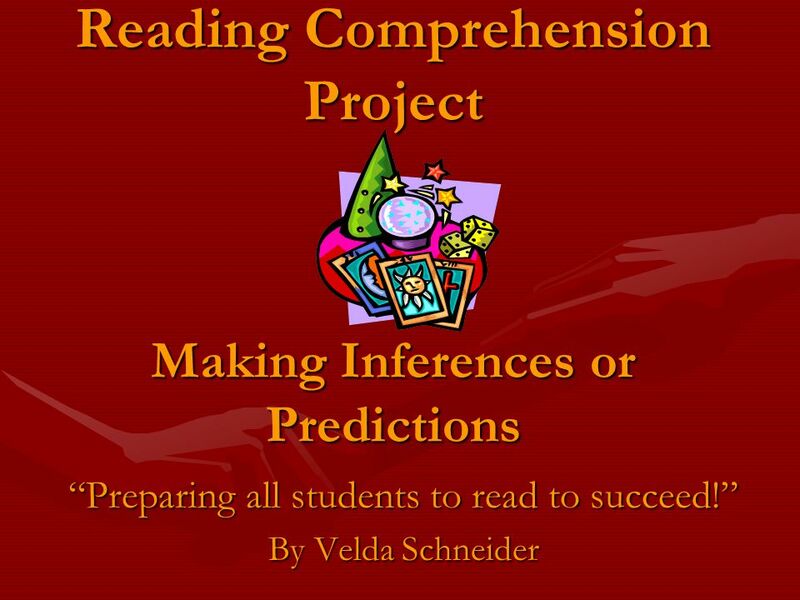 Download ppt "Reading Comprehension Project Making Inferences or Predictions"
Frayer Model Definition Characteristics Concept Examples Non-Examples. 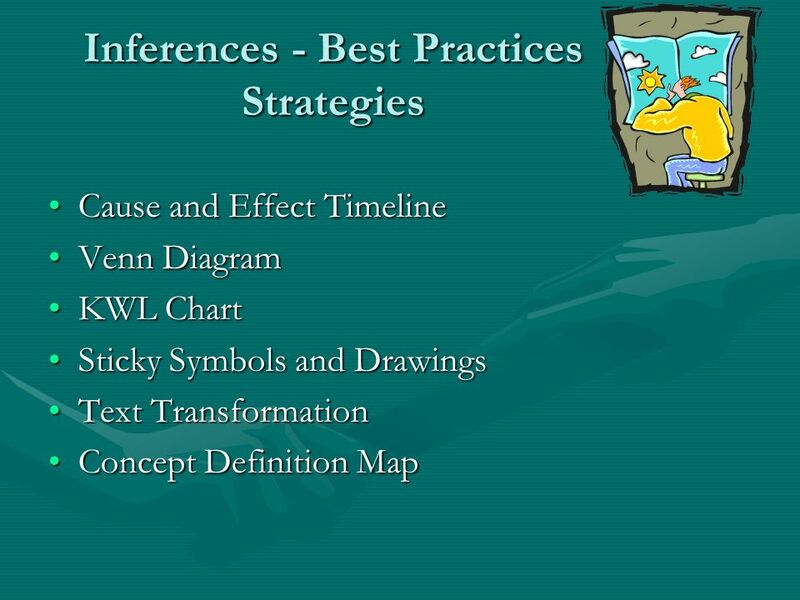 The Strategy Toolbox By Velda Schneider. Laura Robb  Jeff Zwiers Cris Tovani Kyleen Beers  Jeffrey D. Wilhelm  Elizabeth H. Allen. Grade 3: Comprehension The material in this Institute has been modified from the Florida Third Grade Teacher Academy which was based upon the original.